Recently, I was blessed with the opportunity to share some of Sista Docta Alexis Pauline Gumbs’s time for an email interview. I wanted to catch up with her to talk about a project she’s recently completed: The Black Feminist Breathing Chorus. The image featured here is a collage made by Alexis to honor Harriet Tubman, one of the black feminists highlighted in her project. Samantha Taylor: What inspired the Black Feminist Breathing Chorus? How did you decide to take on this project? Alexis Pauline Gumbs: "Last year in the three weeks leading up to my birthday I decided to create a healing mantra practice for myself. I had tried, and benefited from, other meditation and mantra practices, but since my spiritual practice is Black feminism and I turn to the words of Black feminists for healing and affirmation I decided that my mantras would be from 21 of the ancestors who are crucial to my practice of Black feminism. This year my birthday is coming up again and I have decided to share the practice with everyone. This time I am making collages in honor of each of the ancestors and editing together my repetitions of the sayings with music composed by my partner Julia Roxanne Wallace/Sangodare. This is also a way to build collective energy for the Black Feminist Breathing Retreat that we are hosting in Magnolia, Mississippi on July 4th weekend." ST: How do you choose which Black feminist you’re going to quote and highlight each day? Do the people you include self-identify as a Black feminist? However, I know through their words and their actions that all of these ancestors loved Black women and worked very hard to transform the world in ways that have benefited me and other Black women. I am not so much trying to retroactively identify these people as individual "Black feminists" (although many of them did identify that way) I am more honoring them as part of the chorus of voices that have contributed to the existence of the Black feminist reality that I celebrate and live inside." ST: Each of the affirmations and meditations are accompanied by a collage; was there a particular reason you wanted to make this part of the Breathing Chorus? What are some of the benefits and complexities to incorporating multiple forms of art? 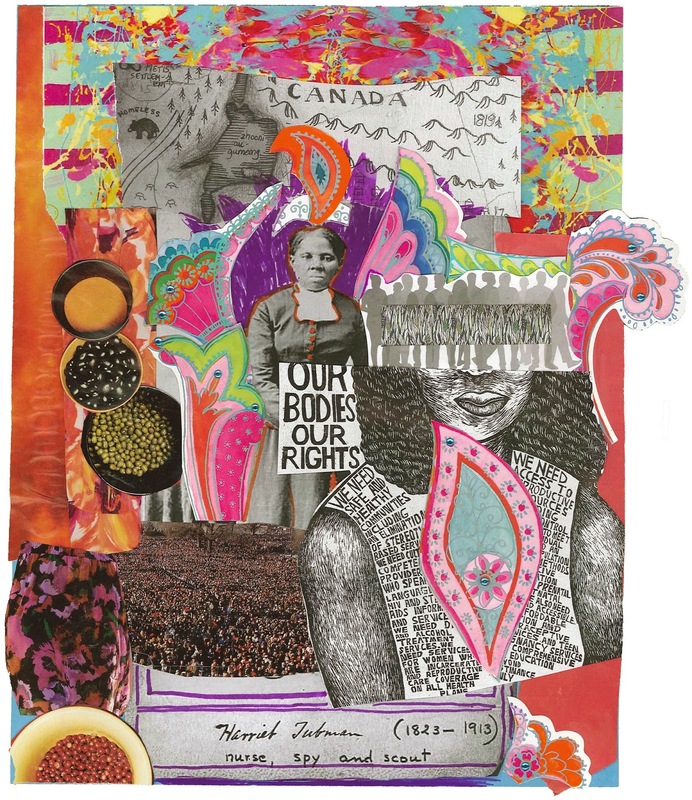 APG: "I love making collages for each of these ancestors. For me it has been a healing and love-filled process. I never met any of these ancestors, so in the act of making these collages I get the opportunity to imagine how I would want to relate to them if we were in the same room physically. And I discover I would want to do so many loving acts. I would want to wrap them in beautiful fabrics, put flowers in their hair, put crowns on their heads and surround them in light. So I do. Since the mantras are already a year old and fully incorporated into my body at this point, the collaging is a major way that this experience is new for me, a new way to relate to these ancestors inside the eternal presence of their energy." ST: There’s also a music aspect to this project, what’s it like collaborating with another artist? What does your daily artistic process look and feel like as you ready each of the meditations and affirmations that are sent out? APG: "Yes! It is a joy to collaborate on this project with Julia Roxanne Wallace/Sangodare who is a brilliant musician, filmmaker and media-world-transformer and also the love of my life. Sangodare [identifies] as a Black feminist and her multi-media movement Queer Renaissance is a major collaborator with Eternal Summer of the Black Feminist Mind on all of our major projects including the Mobile Homecoming project and Black Feminist Film School. It has been amazing to see what Julia is inspired to create from our conversations about these ancestors and the energy of their words and when I am editing it all together I feel like I am in a sound collage made from love, light, listening and learning." ST: Why the three-week time cap on the project? What are the goals of this project? APG: "There are 21 meditations and 21 days is three weeks! When I first decided to repeat 21 sayings for my own practice I was thinking about the power of the number 21. In the Ifa tradition the number 21 is a very important number and it represents the crossroads. I wanted to bring in the wisdom of all these ancestors as I reached the crossroads of my birthday so that their light could surround me as I made moves on my journey. And it worked!!! My intention for the hundreds of participants in the Black Feminist Breathing Chorus is the same. I am hoping that these meditations support people who are in a crossroads in their lives so they can feel surrounded in love as they make whatever moves support their growth and purpose." ST: As The Black Feminist Breathing Chorus is coming to an end, what has the community response been like? What kinds of feedback are you getting? APG: "I feel really honored by the fact that hundreds of people have signed up to get the meditations emailed to them everyday. I actually think we might reach a thousand people on the email list before the process is over! And I love getting emails from people about how the meditations are impacting them. Some people have written poems in response or shared how the mantras intersect with their creative practices. Some people have written to share how a specific meditation helped them with a challenge they have been having. One person even let me know that they play the meditations in their home and their kids walk around saying words from them all day. I love that!" There’s still time to register for the Black Feminist Breathing Retreat happening the weekend of July 4th. Also, there is an option to endorse the project from afar by making a donation in support of low/no-income folks who want to attend but don’t have the means. Community support of Black feminists and the practice of spiritual sustainability is an integral part of the project’s continuation. In an effort to keep the Black Feminist Breathing Chorus going, I want to take a moment to encourage each of you reading this to donate to the Black Feminist Breathing Chorus. If you would like to have unlimited access to the Breathing Chorus mantras consider becoming a sustaining donor of this inspiring project! Samantha Taylor is a full-time student, writer, activist, and artist based in the Pacific Northwest. She lives with her cat, Kiki, collects books, drinks lots of tea, and loves to crochet.